Want to have the taste of a Hawaiian BBQ in your home? Give Maui Steak Shake a try the next time you barbecue or grill meat or poultry. Maui Steak Shake brings out the ono Hawaiian flavor in any meat or poultry. 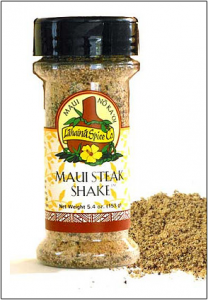 If there is one Hawaiian spice every household should have Maui Steak Shake would top the list. This spice will make all your barbecued or pan-fried meats and poultry taste like they came from a Hawaiian BBQ. Just sprinkle the desired amount of this ono Hawaiian flavor on steak, beef, pork or poultry while barbecuing or pan frying. To get your bottle of Maui Steak Shake and start creating your very own ono Hawaiian BBQ visit our website. I like the spice I ordered from this website. It is delicious and flavor-able. The product is great and ordering it online is very easy. Delivered right to my door. I would recommend it.